Join the Chuggington crew for six fun-filled adventures in Chuggington: Traintastic Adventures! Watch as Brewster tests a speedy new invention, Koko's stunt training saves the day, Wilson gets stuck on the track lift and everybody competes in a big chug-of-war! Young trainees will learn to ride the rails of life alongside their Chuggington pals in this upbeat and fun episodic feature. From now until the end of December, you can download a FREE TICKET for a Kidtoons Matinee! Just click the link to print your FREE Kidtoons Movie Ticket! Visit Kidtoons online to find a theater near you. While you're there, make sure you sign up for the Kidtoons Birthday Club to receive a special gift on your birthday and your child's birthday! 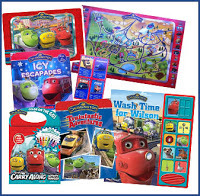 You can also bring the Kidtoons fun home with these Chuggington Coloring Sheets ~ just CLICK HERE! If you're looking for some family fun this weekend, I highly recommend checking out a Kidtoons matinee! This is a great way to introduce families to a big-screen experience with characters kids love and prices that parents appreciate. Flash GIveaway runs 10/26 6:00pm CST through 10/30 6:00pm CST. My favorite memory is of me and my daughter both dressing up at 50's girls when she was 2. One of my favorite Halloween costumes was when my son was a dalmatian and I was Cruella de Vil. My favorite Halloween costume is a fairy costume - doesn't matter who it's for, I love them all! I love seeing pets in costume - it totally cracks me up!! My 3 yo loves Chuggington! My favorite costume as an adult is my 1920's flapper girl costume! Red and flirty! Love it! I would give this to my nephew!! I would give this to my son for his birthday or Christmas. really don't do halloween. My sister and stepdaughter have their birthdays that day so we have birthday parties. My favorite Halloween Costume growing up was being a butterfly--it was awesome. My favorite memorie was going door to door with my brother at a huge development! my favorite memory was when we got home from trick or treating and would trade candies!! I loved dressing up as a football player 2 years ago!